AFP, Al Jazeera, the BBC, Blue Chalk Media, Brinkworth Films, BFBS, Celebro Media, Media Stockade, TRT World and others joined us for the 2017 #iamabroadcaster Masterclass. The 2017 AIBs Masterclass was held on floor two, M by Montcalm, Shoreditch, London EC1V 1JH on Thursday 2 November 2017.This half-day event allowed delegates from around the world the opportunity to meet colleagues and to share knowledge ideas and gain inspiration. Some of the world’s top factual programme makers from Australia, France, Turkey, the UK, and the USA took part. The Masterclass – on Thursday 2 November, the day after the main awards event – ran from 0915 until 1430. It was informal and highly interactive. 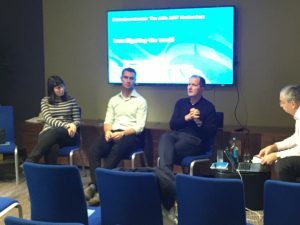 It provided a forum to discuss the way programme making and story-telling works in different markets, and to explore the challenges of reaching linear and online audiences. #iamabroadcaster – The AIBs Masterclass promises attendees a great learning and networking experience alongside some of the leading programme makers in the world.